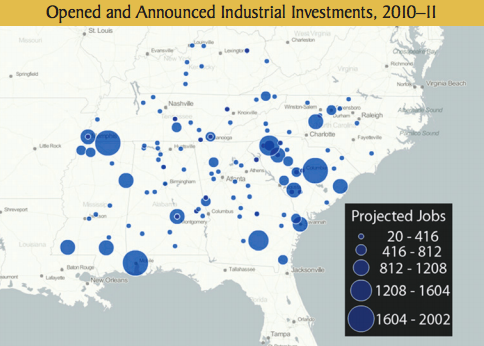 The Southeast United States1 has become a hotbed of innovation and technology. 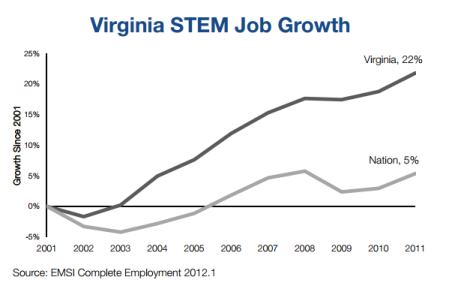 The region has also become a magnet for the STEM employers – Science, Technology, Engineering, and Math. The West Coast and the Northeast are often billed, essentially by default, as the drivers of technology innovation within the US. However, a simple common-sense analysis of various numbers, statistics, trends, and patterns – from a wide variety of sources – paints an entirely different picture. First, it stands to reason that the key component driving innovation is educated individuals. While the Southeast US saw a large influx of people in general – 5 Southeast states were among the top ten in net-migration gains in 2012 – the region was also one of the largest destinations for the migration of educated individuals. 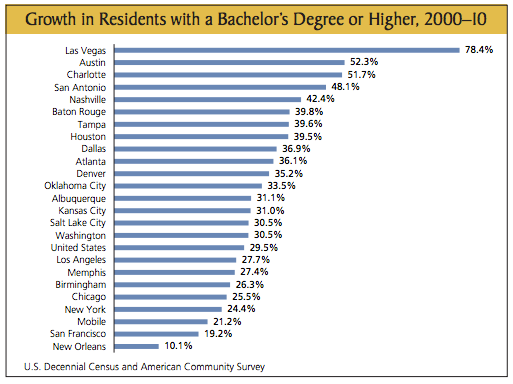 In fact 4 of the top-10 cites that saw the largest % of metropolitan growth, in age 25+ population with bachelor degrees, from 2000-2010 were in the Southeast US. 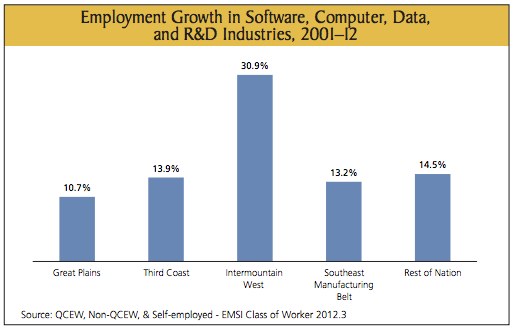 The relative health of the region’s economy also contributes to the growth of the technology sector in the Southeast US. 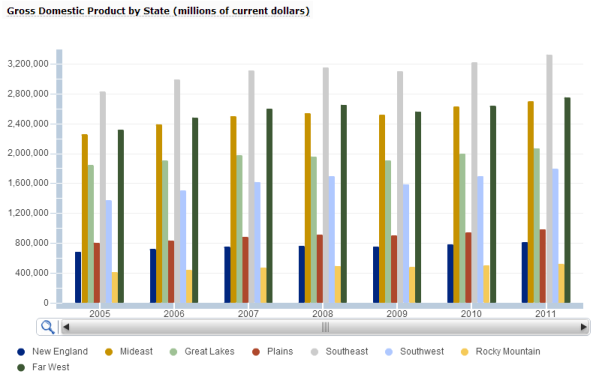 The Southeast economy, in terms of both Regional GDP totals (Fig. 1), and the year-over-year GDP growth rate, has drastically outperformed all other regions since 2005. While a sizable part of this growth has been driven by the resurgence of manufacturing within the Southeast US, the technology industry is flourishing (Fig. 2). In a recent Forbes article, Joel Kotkin examined the STEM job-growth from 2001-2012 in the 50 largest metropolitan areas in the US. Several Southeast cities had wild STEM job growth rates: Arlington, VA – 21.1% growth – the largest growth rate of all 50 metro areas; Raleigh, NC – 17.9% growth; Jacksonville, FL – 13% growth; Nashville, TN – 6.7%; Virginia Beach, VA – 4.8% growth. These results are all the more staggering when compared to the STEM growth rates of the traditional tech powerhouses: San Francisco – 2.5% growth; New York City, NY – 4.6% decline; Los Angeles, CA – 7.1% decline; and shockingly: San Jose-Sunnyvale-Santa Clara, CA – 12.6% decline. Further, a 2012 US Dept. of Commerce Report, examined all 50 states in a wide-variety of categories. The report ranked the states in these various categories. In the “Entrepreneurship and Innovation” category – which measured STEM job creation, High-technology job creation, the concentration of jobs in STEM and high-tech, and academic research activity – Virginia, Georgia, and North Carolina cracked the top-10; in the “Talent Pipeline” category – which measured various academic activities – Florida was ranked number one; Florida was also ranked number one in the “Infrastructure” category. The established players in the high-tech industry have been flocking to the Southeast US for some time now. Microsoft has corporate offices in AL, FL, GA, TN, NC and VA; IBM has offices in GA and NC; Google has a data center in SC, and corporate offices in FL and GA; Intel has a corporate office in SC; Qualcomm has regional offices in GA, FL, and NC; HP has offices in SC, TN GA, FL, NC; Yahoo! has corporate offices in FL, GA, and VA. Further, 482 of Inc. Magazines Inc. 5000 list are located within the Southeast US. There is a thriving startup community within the Southeast US, however there is no real way to quantify the number of startups with any sort of accuracy. That said, Startup America has a database of facts and figures on all members. Using these numbers as the absolute minimum, the Southeast US is home to 2751 startups, which have created 23,421 jobs. There is also a vibrant system of startup accelerators. Accelerators like The Iron Yard in Upstate South Carolina (more on these guys soon), The Factory in St. Augustine, Flashpoint in Atlanta, The Jumpstart Foundry in Nashville, and many, many others. 1. There is not a wide consensus as to what states actually make up the Southern region of the United States, and many Governmental regional designations are inconsistent. In this article, the Southeast US will consist of the states overseen by The Southeast Regional Office of the Chamber of Commerce of the United States: Alabama, Georgia, Florida, Mississippi, North Carolina, South Carolina, Tennessee, and Virginia.